It was Opening Day for Major League Baseball the other day, which is always a red letter day for me. It’s sort of like 2013 has officially began, that my day to day life now has something with which to synchronize, something to fall in rhythm with. So, even though I have been feeling under the weather for several days, I was able to complete a new piece, one that had been banging around in my head for a long time. It incorporated the perfect geometry of the baseball diamond nestled among a tightly clustered neighborhood of Red Roofs. It’s an odd piece, one that feels both typical and atypical at once. That’s a quality that I like. 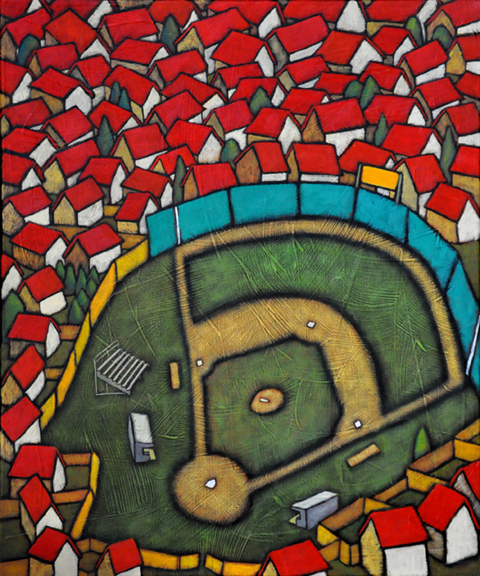 I have been wanting to incorporate the baseball diamond into one of my landscapes, perhaps influenced by some of the folk art paintings that did it so well. 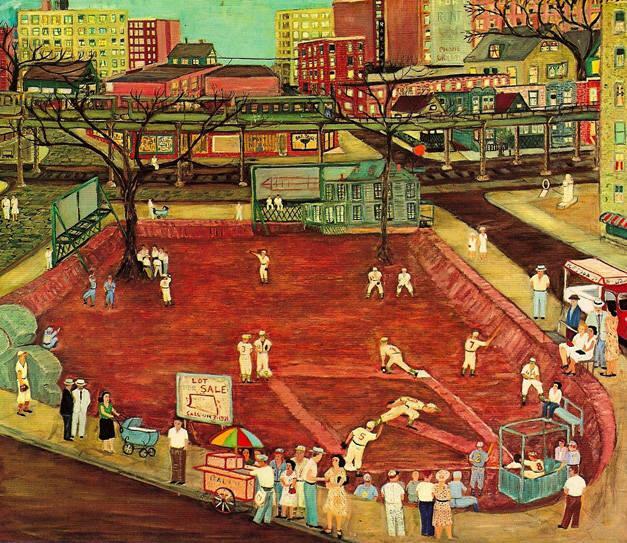 I have featured some of these here, such as Malcah Zeldis’ Homage to Hank Greenberg, shown at the bottom of this page, or Ralph Fasanella’s Sandlot Baseball, shown here on the left. 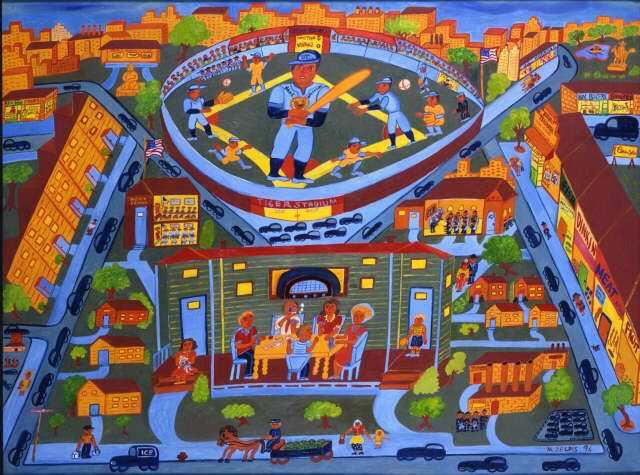 These are paintings I like very much as much for the baseball aspect as for the wonderful folk art manner in which they are painted. There is something in the sight of a diamond that has a hypnotic effect on me, something I hoped to capture in a painting. I always remember the feeling when I was a kid and we went to Shea Stadium to see the Mets play, especially for night games. You would head out from the dim light of the concourse and emerge into the brightness of the field lights. The green of the field was so vibrant, the brownish red of the infield dirt so rich. There was something perfect in looking down on that diamond, a design that made so much sense to a child’s mind. A beautiful geometry, one that equalizes weaknesses and strengths. The length of the basepaths, for example, are such that on a hard hit ball to the infield a fast runner can be easily thrown out at first but a slower runner can often beat out a soft groundball. Here, a small man could easily conquer a much larger man from a distance of 60′ 6 “, the distance from homeplate to the pitching rubber. Skill overcomes pure strength, size and athleticism. If you ever saw Michael Jordan flailing helplessly at minor league curveballs, you’ll know what I mean. I could write a lot more here. And I probably should. But I simply want to show this new piece, a 20″ by 24″ that I’m calling Geometry of the Heart. Here, the ball park, a Little League sort of field, represents the heart of the neighborhood, the openness of the field stands in direct contrast with the cramped houses. This is a painting that I have really enjoyed painting, one that is probably more for myself than for anyone else but one that I needed to paint.